I am lucky enough to be the launch editor for this magazine, but creating it hasn't all been plain sailing. We wanted to create a magazine that was different to others on the market, there would be no point in simply doing the same thing all over again. I wanted it to be a magazine for 'today', a magazine that would meet the needs of readers now, that reflects changes in society. Many people want to try their hand at a craft, be it wood or anything else, but they often lack training and therefore knowledge, lack space in modern properties - often without room for even a shed - and may have a limited budget too. So we are concentrating on techniques to help you learn, create in smaller spaces, work within a budget and look at a variety of woodworking crafts - hence the title. We even cover countryside and environmental issues, because we know these things are dear to many peoples' hearts. We also have fascinating features to enlighten and entertain. Best of all we want to encourage you, the readers, to participate in the magazine and share your skills and knowledge with us all. 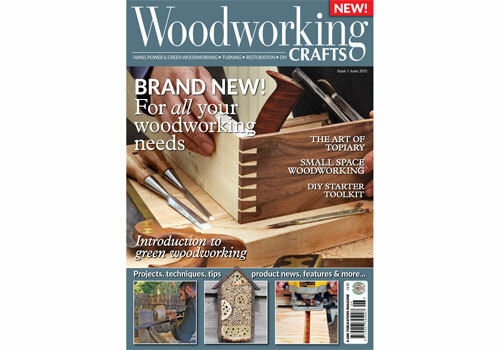 It's been a lot of fun getting the magazine this far, I hope you enjoy reading it as much as we have all had in putting Woodworking Crafts together.